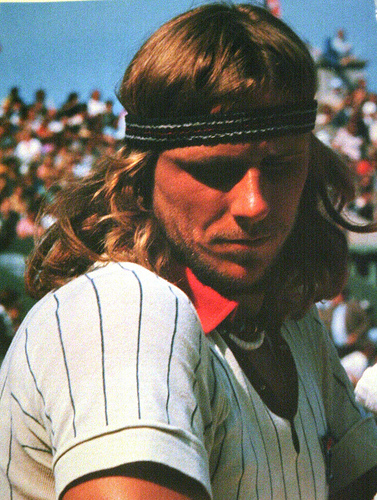 The beauty and brutality of tennis is that it's an exercise in solitude. Unlike in team sports, there's simply nowhere to hide in tennis. We don't have baseball's rehab starts, football's injured reserve or basketball's veteran minimum salary. Tennis fans don't even have the solace of rooting for the uniform. We can't hope that someday the tennis equivalents of Red Sox or the Knicks make good, even if it's a couple decades after we first fell for the team. That's right Richard Gasquet fans, your boy doesn't have forever. Once a paragon of consistency, Hewitt has won 28 career ATP titles, with at least one every year from 1998-2007, This year, in part due to inactivity, Hewitt has only won nine matches. He fell in the second round earlier this week in Atlanta. The 30 year old left his native Australian Open ranked a respectable 54th in the world, but failing to defend his title at Halle knocked him out of the Top 100 for only the second time since 1999. Sterling history notwithstanding, since 2008, the controversial Aussie has accumulated more surgeries than titles: two hip surgeries and a left foot operation versus just a Houston crown in 2009 and Halle hardware last year. Hewitt's far from alone. 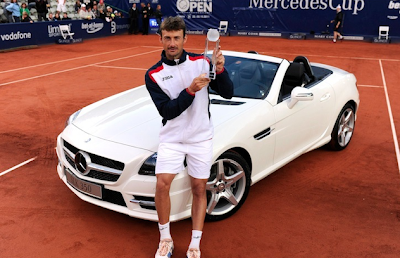 In a sport where you eat what you kill, it's been lean times lately for Juan Carlos Ferrero. You remember Ferrero, right? Spanish guy, World No. 1, French Open champion...no, no, the other one. 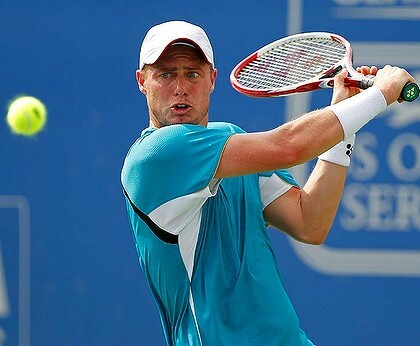 Lleyton Hewitt was the 20th man ever to be ATP World No. 1, Ferrero was the 21st. Though if we're being honest, Ferrero was No. 1 in sort of a blink-and-you-missed-it way. Ferrero's game is best suited to the European red clay, but he almost made me look like a genius when he made the 2003 US Open final...I was probably the only non-Spaniard to predict Ferrero would win that title--he'd of course lose to Andy Roddick. Ferrero spiralled downward from there. He went from being French Open champ, US Open finalist and World No. 1 in 2003 to not winning a title for the next six years. After being edged out for year end No. 1 in 2003, Ferrero would finish the following year clear outside of the top 30. First, there was chicken pox, then there was injury, then presumably just poor form as Ferrero wandered in the wilderness of bad losses. The turning point for Ferrero seemed to come at the end of 2004. Coming off a 67 win season the prior year, Ferrero would win just 23 matches in 2004, he made just one final (a loss to Hewitt early in the year), but he luckily found himself with a massive redemption opportunity at year's end. Spain reached the Davis Cup final and who would win the pivotal tie? Well, not Ferrero. The man who was World No. 1 just over a year prior was relegated to only playing the doubles point, for the record, he lost. The singles matches were handled by Carlos Moya, the ex-French Open champ and then still a top 5 player himself and a kid ranked 51st in the world at the time whose only title to date was at a small clay court event in Poland...yep, Rafael Nadal. Nadal has cast a long shadow over Spanish tennis, relegating the indefatigable David Ferrer to second banana, overcoming Fernando Verdasco in arguably his finest moment at the 2009 Aussie Open and almost vampirically snuffing out the flame of Ferrero. That other Spanish World No. 1 has stuck around though, traipsing through a decimated draw to a title in Stuttgart last week. In the process, he temporarily reversed his slide into the rankings netherworld, he's now back up to 64th in the world. It hardly seems fair to consider Andy Roddick in the same company as Ferrero and Hewitt, but they are closer contemporaries than you might imagine. Roddick won the US Open title over Ferrero, a year after Hewitt won his last major. He took over the No. 1 ranking from Ferrero, becoming the last man to lead the computer rankings before the dawn of the Fedal era and he is on the verge of turning 29, just a year younger than Hewitt, two younger than Ferrero. Roddick might well be the most unappreciated player in recent memory. He's only missed a handful of weeks in the Top 10 since he first climbed into the upper echelon of the tour way back in 2002. He's played five major finals and won every time he didn't come up against Roger Federer (that would be once). If he wasn't cuddling with Brooklyn Decker as I write this blog post, you would almost wanna buy the guy a beer, give him a pat on the back and say "tough luck, buddy." The standard bearer for American tennis, Roddick pounded his serve all the way to 30 career titles, but his legacy is unfortunately defined most by a loss. 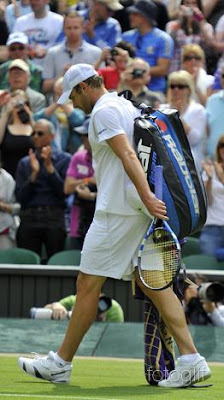 In an era where damn near everyone lost to Roger Federer, Roddick suffered perhaps the most painful of those losses. To have three shots at a Wimbledon final, to have a cannon serve on the slick grass and to have the experience of having already won a major behind you, it's shocking that Roddick never raised the champion's trophy at the All England Club. A year after being dethroned as champ in the consensus greatest match ever, Federer clawed his way back to the tennis summit in that 5–7, 7–6(6), 7–6(5), 3–6, 16–14 win over Roddick. Although he doggedly remained in the top ten, it had been three years since Roddick's last major final at that point, four years since his last at Wimbledon. It was a match that some would say he deserved, but it was almost as if he was destined to lose. That backhand volley is seared in the memory of every fan, and I wouldn't be surprised if it's the one shot Roddick sees in his nightmares. Since that loss at Wimbledon, Roddick's missed a lot of time with injury; he's only been past the round of 16 at a major once (Australian Open 2010 - QF), but he has won a respectable three titles. More telling, I'd say is Roddick's approach to this year's US Open Series. At a time of the year when the European powers tend to rest and coming off of a clay and grass court swing where he played just ten matches, Roddick's only scheduled to play Washington and the two mandatory Masters events (where the full contingent of stars will appear) before the US Open. You could say he's saving himself for Flushing, but in the last two years, he's won all of three total matches there. Reportedly, when negotiating a deal with Lacoste, the clothing company wanted to cut Roddick's pay if he fell out of the Top 15. He reportedly, but believably, said, he'd retire if he fell out of the Top 15...Dare I say, consider the towel thrown in. Someway, somehow, no matter how big the star, no matter how high they've climbed, this is where it always seems to end up. All three of these men have been World No. 1s, they've all won majors, they've all played on winning Davis Cup sides, but all of those things seem to be far in the rear view mirror. It makes me think of the fact that during every French Open and Wimbledon we're regaled with the story of how Bjorn Borg retired at 26 after losing the Wimbledon and US Open finals to John McEnroe. It's become the commentary equivalent of the Connors-Krickstein match at the 1991 US Open...it may have a little something to do with McEnroe often being in the commentary booth, but there's more to it than that. Popular opinion is that Borg was crazy. How could he walk away from the game when he had so much more to give? How could he retire when there were so many more titles he could capture? I think a better question is, and the one Borg himself may have found himself contemplating is: When you've won all that you can win, how long can you go on losing? Looking at Hewitt, Ferrero, Roddick, three stalwarts of the 2000s era ATP, you have to wonder how long they'll keep going and what their motivation could possibly be? My gut feeling is that Hewitt will ride off into the sunset after the next Aussie Open, it's harder to say with the other two, but after Ferrero's protracted fallow period every title probably adds a bit of gas to the tank. Beyond the guys above, this question obviously extends to Roger and Rafa. How long will the ATP standard bearers play out the string? 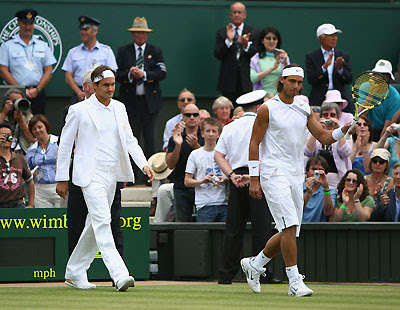 Federer, nearing 30, has played a full career and no one would be shocked if he hung up his Nike dinner jacket after the Olympics next year. His resume is as complete as the game has ever seen and I doubt any pundit would give him too much stick for retiring to Dubai with Mirka and the twins. Nadal's a more interesting case. He's certainly young enough to play for a while yet at a high level and I certainly am not insinuating he'll never win a big one again, not yet. What I wonder about both of those guys is with the outsized success they've experienced, will they be content hanging around Roddick-style on the fringes of the top ten, winning a small title or two a year or worse a la Hewitt and Ferrero? Or will they look around at the landscape, see their shot at the big ones gone, take their Nike headbands and head home. Seems every player's got their own way of finishing their pro careers. Some abruptly, some in protracted fashion. How will these guys do it? In true tennis player style, they'll make those decisions on their own. In fact, not just women, but the designer dresses, shoes, bags, women evening dresses, fake louis vuitton and other clothing have been presented and designed by the best designers of the country and the assurance is there you will not discover their whereabouts somewhere else. rolex replica You can view the entire bunch of beautiful dresses and Women jackets online which are available online. fake hublot There are various companies which are available online but the quality and designs that you will find through matchless. fake cartier Thus, you will not discover their whereabouts somewhere else. replica chanel Thus, you can anytime easily go to the website and benefit from the services offered by them.